Here is a helpful approach for teaching kids to pray. It’s a format that allows children to recall and pray in their own words for five different groups of people. All this lines up with the five fingers of their hand. Click here for a print friendly version of this page. There are a few different versions of the five-finger prayer on the Internet (here | here | here). I was unable to track down the original, so I’ve collected below what seems like the best of each version. WE have another version of the hands prayer based on the Lord’s prayer. Thumb (people who are close to you) These are your close friends and family, often the first you think about when you pray. Give thanks to God and ask his protection on your parents, siblings, friends, and classmates. Pointer (people who point the way) These are leaders in your life, such as teachers and pastors. Offer God your thanksgiving for them and ask him to help them in their important work. Tall Finger (people in authority) The big people in the world need prayer too. Ask God to give wisdom to our government, military, and police. Ring Finger (people who are weak) This is your weakest finger. We should remember others who are sick, live in poverty, or are treated badly. Pray that Jesus would give them new strength. Little Finger (your own needs) God wants to hear your needs too, especially when you put others first. Pray for your own growth in mind, body, and spirit. 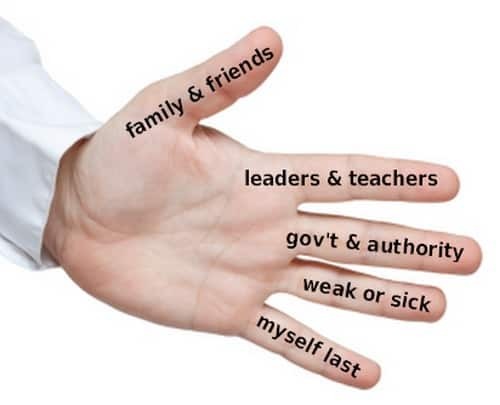 We would love to hear your opinion on this five-finger prayer model. Click here to leave a comment below. You can share your own version or make suggestions for teaching this to children. You might also enjoy our prayer coloring pages and simple prayers for children. Right click on this link to download the following printable in PDF format sent to us from Paula Baytieh. After writing this post, I discovered a similar explanation from Christine Jones on her video blog. 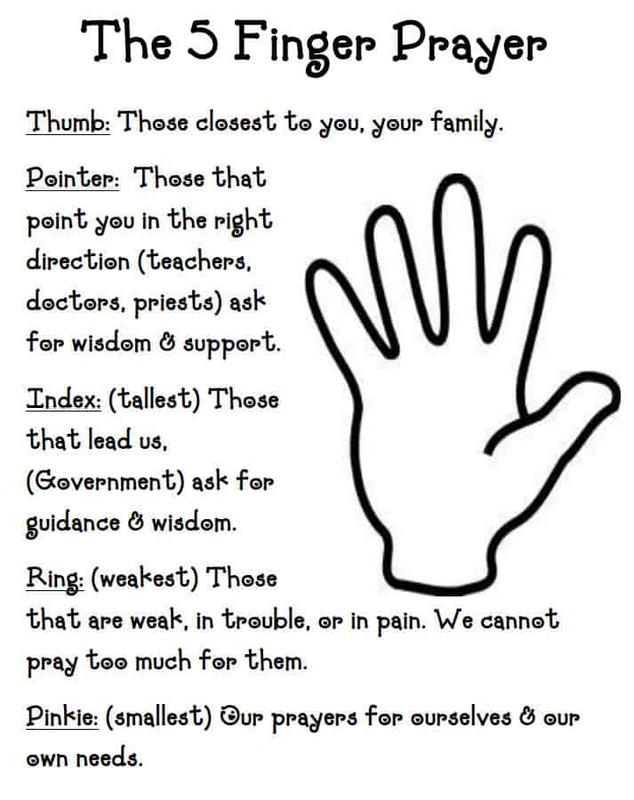 The fingers have a little different meaning, but this would be a great way to adapt this prayer for preschool aged children. I was browsing your Facebook page this evening and came across this post. I really like how you laid out the concept here. The video made a good point, too, about the ring finger being the only one that cannot stand on its own. That is cute. We use this prayer every week in our church toddler group. We sing nursery rhyme “Tommy thumb where are you?” & say short prayer at end of each section for relevant topic and link with actions: Tommy thumb place thumb on your heart (for those close to us), Peter pointer point far away (for friends/family who are far away), Toby tall -stretch up tall (teachers/government/wisdom for decisions), hold ruby ring for those who are ill, baby small-all the little ones at the group. We bring in specifics where necessary such as new babies/members who are ill etc. Tony Kummer (Editor) reviewed & updated this page on : February 19, 2019 at 7:11 am. All our content is peer reviewed by our readers, simply leave a comment on any post suggest an update.